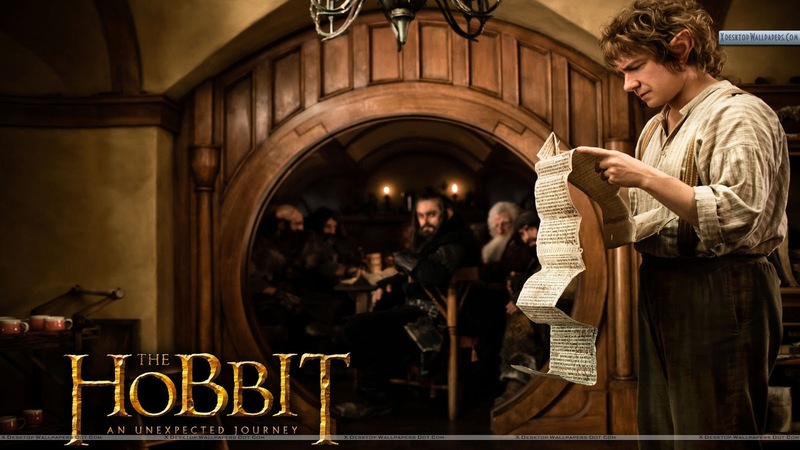 Speakin' Geek: 'The Hobbit; An Unexpected Journey' Premiere Review. 'The Hobbit; An Unexpected Journey' Premiere Review. He's probably thinking, "I better check the fine print". 'The Hobbit', many years have come and gone since 'Return of The King' graced our screens and the curtain dropped on the piece of cinematic wonder that was 'The Lord of The Rings' trilogy. Yet throughout the world there were rumors, hushed whispers where people dared to believe that Bilbo Baggins adventure, that was so tentatively teased at in 'The Fellowship of The Ring' might come to the big screen. Ten years on and a huge amount of drama later we've come to the place where it all began. Many people wondered who would be the director to bring this film to the screen, would Peter Jackson return for another jaunt through Middle Earth or would we get a completely new world with new wonders from the creative genius of Guilermo Del Toro. People were unsure but in both cases I believed that we'd still get a great film. Due to delays and other problems Del Toro dropped out as director and people cried out for a hero, and he answered. Peter Jackson returned to his people and the realm he defined for a generation and as if that wasn't enough, Del Toro stayed on to help take some of the weight for Jackson. It was a win win in my eyes. Then the day came closer and closer, actors were announced and a single film was turned into a two part series and then it was shifted into a trilogy. How can this even be achieved? As I hoped this wouldn't diminish the film going experience I found out from a reliable source that the reason Jackson turned 'The Hobbit ' into a trilogy was because he was including EVERYTHING, every little bit of information and character development from 'The Hobbit' and its appendixes. How will this turn out? Only seeing the full trilogy will answer that question but I tell you now after 'The Hobbit' my hopes are high. After watching 'The Hobbit' in IMAX I have to say it was mindblowing, the experience was wonderful and the sheer level of detail was outstanding. There was amazing cinematography and the acting was top class. Martin Freeman may as well be the son of Ian Holm, he plays a younger yet much more tense filled hobbit. He brings a wonderful innocence to the role which will remind you very much of Elijah Woods portrayal of Frodo( before the rings messed with Frodos head.) Ian Mckellen makes a welcome return as Gandalf the Grey, much more jovial than he was in 'The Lord of The Rings', you some times forget how powerful he really is, until those moments happen and then you're reminded just how great he is. After finding out that Ian Mckellen almost didn't return as Gandalf I find that I appreciated him even more in the role, apparently he didn't find it challenging to return to the same role but for the fans Ian couldn't say no, how lovely. Now onto the Dwarves, if you, like me, felt that 'The Lord of the Rings' trilogy didn't have enough Dwarves then prepare to be very happy, I know I was. Twelve dwarves, twelve dwarves that are just so much fun. From the opening scene of Erebor to the battle at Moria, the dwarves just keep showcasing their boldness, their drive and their determination. No dwarf exemplifies this more than Thorin Oakenshield, played by the fantastic Richard Armitage, he is a King with no Kingdom and you see it in the way he walks and in his face. There is rage only tempered by shame, the shame brought on by failure. He feels he owes his people there home and he will reclaim or perish trying. The other dwarves are a motley crew of misfits who show many different sides to the dwarf race through there own little perspectives. It's here that I'll talk about Kili the dwarf or as we know him, Aidan Turner, a Dublin born actor from 'Being Human' fame. Kili is brother to Fili, two of the younger dwarves in the company, cousins to Thorin they are the more mischievous and adventurous of everyone in the film and at times come off as kids not sure what they've gotten themselves into. My final word on the film is a quote from the film that just caught me by surprise and made me laugh, it perfectly exemplifies the film.